The RRS James Clark Ross arrived at the NOC last week, returning Autosub Long Range (ALR) home after its first scientific deployment in the Antarctic. 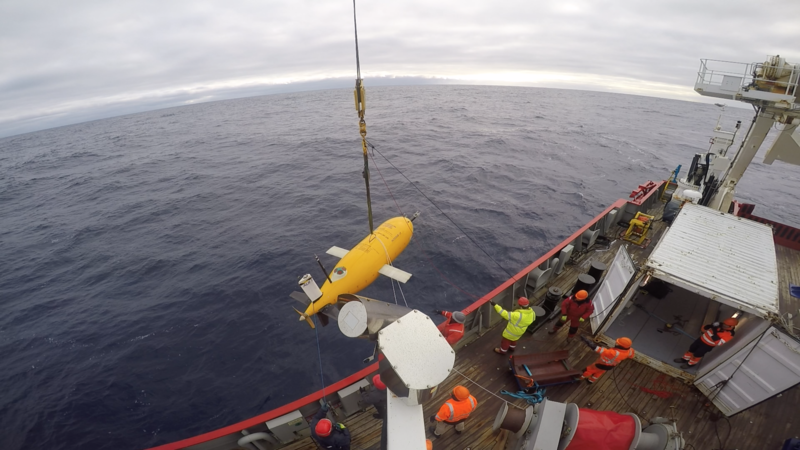 Developed by the NOC, Autosub Long Range, the latest type of autonomous underwater vehicle (AUV), captured unprecedented data about some of the coldest abyssal ocean waters on earth. Supported by NOC engineers, the team, which involved scientists from the University of Southampton and British Antarctic Survey, collected data on temperature, speed of water flow and underwater turbulence rates of the Orkney Passage, a region of the Southern Ocean which is around 4,000m deep and roughly 500 miles from the Antarctic Peninsula. In order to visualise the progress of ‘Boaty’ and place the data in the context of the complicated terrain in the region, the team have created an animated fly-through of the Orkney Passage. The information collected will now be analysed to understand the complex process of ocean mixing and how it affects climate change. Welcoming ‘Boaty McBoatface’ back from its first mission, Universities and Science Minister Jo Johnson, said “Fresh from its maiden voyage, ‘Boaty’ is already delivering new insight into some of the coldest ocean waters on earth, giving scientists a greater understanding of changes in the Antarctic region and shaping a global effort to tackle climate change. Professor Alberto Naveira Garabato from the University of Southampton, the lead scientist of DynOPO, said “The Orkney Passage is a key chokepoint to the flow of abyssal waters in which we expect the mechanism linking changing winds to abyssal water warming to operate. Our goal is to learn enough about these convoluted processes to represent them (for the first time) in the models that scientists use to predict how our climate will evolve over the 21st century and beyond. Read more on the development of Marine Autonomous and Robotic Systems at the NOC here.